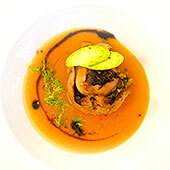 GourmetVoyageurs.com - Upscale Food and Travel eMagazine. 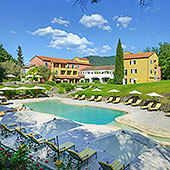 A Wonderful Country Hotel for Golfers, Gourmets, Beach Goers and Others. Cradled between Monaco to the west (85 kms) and Portofino to the east, Hotel La Meridiana(Relais & Châteaux) is tucked away on the edge of the village of Garlenda in Liguria on the Italian Riviera at Albenga near and the beaches of Alassio. From the earthtone colors of its decor to the hotel and restaurant staff, La Meridiana is warm and welcoming. The rooms provide uniquely Italian colors and textures. Its restaurant "Il Rosmarino" is excellent as is its 18 hole golf course that attracts golfing enthusiasts from around the world. The Segre family are renowned for their gracious hospitality giving one the feeling of being a guest in their charming home. The Garlenda Golf Club is a serious course offering championship tees spread over 6 kms (4 miles) of fairways and greens in this lush valley. You can get their by golf cart. We loved this area for its simplicity, the hotel surroundings are lovely but the region itself is not especially picturesque. It is a very real part of Italy. If you love the simple tastes of rich black olives, fabulous pesto, really good local olive oil, lovely regional wines, you are in the right place here. Its restaurant "Il Rosmarino" has taken local tastes and ingredients to a new high. Built in the 1970's, the hotel has all the comforts of todays top hotels with the grace and ambiance of older times. Quiet and peaceful, surrounded by countryside, vineyards and fruit groves as well as its own expanses of gardens and trees, the hotel offers a huge lounge divided with intimate nooks for privacy. Some feature square tables with four chairs for cards, games or just writing letters. Others are created like small amphitheaters with U shaped arrangements of sofas and lounge chairs in front of the plate glass windows with their views of the gardens and the pool in the distance. 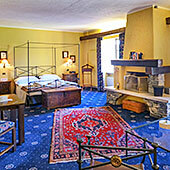 The rooms are decorated in a relaxed and inviting combination of contemporary sofas with antique chairs and tables. The latest in satellite TV just fits into the decor. The bathrooms are finished in pale earth tone rustic tiles that could only be designed in Italy. Some suites have two bathrooms for "his and hers" needs. Almost all the rooms and suites have either a balcony or terrace. The large pool is designed to evoke the feeling of a natural swimming hole under a waterfall. A relaxing jacuzzi is set into one side. There is also a sauna available as well as massage. This is a golfer's paradise with the Garlenda golf Club just a few steps away. If the comments of the golfers we met while there are anything to go by, the course is very nice indeed. The Club House has their own restaurant which is just as well because the hotel's restaurant is normally not open for lunch. Normally they serve light lunches alongside the pool weather permitting. The hotel reception will arrange for booking tee-off times, private lessons and practice sessions including trolley and golf cart rentals. The hotel provides bicycles for those who can resist the links. The valley is very level and is a perfect non-challenge to those who are not Olympic marathonists. The hills surrounding the valley will test the lungs of those more intrepid. Tennis is available both inside and outdoor at the Garlenda Tennis Club. Again reception can make arrangements for you. It is just 2 kms from the hotel and can be walked or bicycled easily. Clearly Hotel La Meridiana is a holiday destination in itself. They are also dog friendly although our furry friends are not allowed in the dining room.